When Ken Duckworth, MD, applied for his residency, he included an anecdote about what inspired him to be a psychiatrist. He wrote about experiences with his father, a wonderful man who suffered from bipolar disorder. It’s a fairly common story shared by aspiring doctors: a disease inflicts their loved ones, and drives them to a career in medicine. But this was 1986 — a time when Duckworth disclosing his father’s mental illness was unheard of. Duckworth eventually got his residency at a Harvard facility, but for the following decade, he experienced reaction from his application letter. “If anybody talked about depression in themselves or suicide in a family member, they would bring in me and say, ‘Ken knows all about this’,” Duckworth told MD Mag. The one day, those requests stopped forever. Duckworth, now the medical director at the National Alliance on Mental Illness (NAMI), was meeting new colleagues who were just as open to discussing how mental illness affected a loved one. The conversation he had to carry alone was now growing. “This was now the ordinary bread and butter. This was OK to talk about,” Duckworth said. A lot has changed in the 30-plus years since Duckworth first joined the ranks of the psychiatry. The issues of mental illness are no longer in the shadows, but even as it’s become an open field of discussion, experts say people living with mental health challenges continue to face a seemingly intractable problem: stigma. Patrick Corrigan, PsyD, a psychology professor at the Illinois Institute of Technology, has spent 2 decades studying the association of stigma with mental illness. He told MD Mag there is a dichotomy in how mental health is discussed in pop culture and media. On the one hand, some celebrities—like Demi Lovato and Jim Carrey—have made public their mental health struggle. Such big-name disclosures have a positive, but limited, effect, he said. However, the impact of famous people discussing their cases can be counteracted by other negative portrayals of mental illness in the media. “There’s pretty clear evidence [stigma] is getting worse and probably the best post-hoc reason for that is the degree to which we equate these god-awful shootings with mental illness,” Corrigan said. As US mass shootings have increased, political leaders and others have framed the problem as one of mental illness, suggesting that better access to mental healthcare might have prevented some of the shootings. The problem, Corrigan said, is that it creates the perception that anyone struggling with mental illness is a danger to society. Amresh Shrivastava, MD, of the University of Western Ontario, said it’s difficult to make concrete assertions about the level of stigma because stigma is difficult to quantify. What Shrivastava can say is that stigma has been an equal problem in every country’s he’s practiced, including India, the United Kingdom, and Canada, and that it isn’t going away. “There are no patients who don’t have stigma,” he said. While Shrivastava said it’s difficult to measure the level of stigma at any given moment in time, a psychiatrist can and should gauge the impact of stigma on an individual patient, both in terms of societal stigma and self-stigma. He said psychiatrists need to take stigma seriously—to address it as a clinical risk. 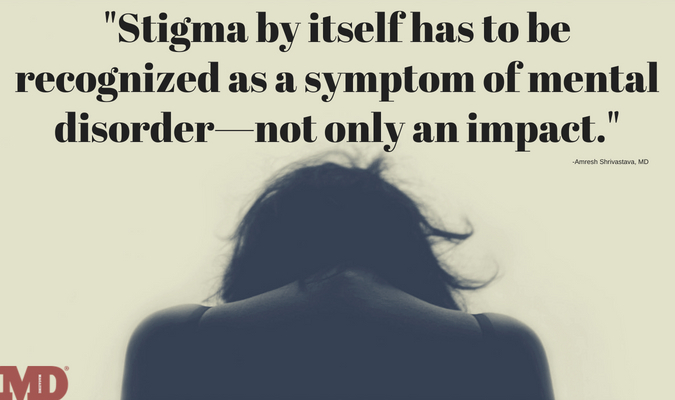 “Stigma by itself has to be recognized as a symptom of mental disorder—not only an impact,” Shrivastava said. Just like any other symptom, he said, when the stigma is left untreated it can cause serious damage to the brain, and even to the patient’s life. Relapse is more susceptible in patients with untreated stigma, and risk of suicide is increased. Duckworth said psychiatrists need to be deliberate and understanding when having the “stigma” conversation with patient. Corrigan said people living with mental health issues can learn to deal with stigma, but that’s not good enough. Stigma can also negatively impact them in various aspects of everyday living, such as housing and employment discrimination. When it comes to employment matters, legal protections are in place, but they have certain limits. While the Americans with Disabilities Act (ADA) protects workers against discrimination on the basis of a mental illness, it only applies if the employer is made aware of the employee’s condition, and it doesn’t provide for unlimited accommodations. For instance, the ADA might not help a cab driver hired to work an overnight shift who can’t work at night due to the impact it would have on his Circadian rhythms. Duckworth said the same concern applies to medical residents who have bipolar disorder and are frequently assigned long overnight shifts. Many people with mental illnesses find difficulty finding a job in the first place. A report released by NAMI in 2014 found 4 out of 5 patients who received public mental health services were unemployed. Discrimination is also constantly prevalent in health care insurance matters. Even with mental health parity legislation, NAMI and other groups have found access to care a continued major problem. Earlier this month, the alliance put out a report showing a rollback of the Affordable Care Act would potentially bring back an era where certain services were not covered by insurance, or where patients were charged steep premiums due to their mental health. For physicians dealing with patients, the fight against stigma and discrimination isn’t only an outward fight. It can also require introspection. A number of studies have suggested physicians, including psychiatrists, harbor prejudice against people with mental illness. A 2000 study found patients with mental illness were less likely to receive certain cardiac procedures. The paper, by Emory University’s Benjamin G. Druss, MD, MPH, posited a number of possible reasons for the disparity. One of them, however, was physician discomfort with mental illness, which Druss suggested might make them reluctant to offer more aggressive treatments. Corrigan added that his own research has shown physicians are more likely to discount things patients say if they know the patient has a history of psychiatric issues. The bias sometimes exhibited by physicians shows that simply education people about mental illness is not enough to stop stigma, Shrivastava suggested. In his research, Corrigan has looked at 3 approaches to curbing stigma: education, protest, and contact. Education has some benefit, but Corrigan agreed with Shrivastava in the belief that education can only go so far. Protest, however, has not been found to do much at all. What really makes a difference, Corrigan said, is contact. Simply put, when a person knows someone with a mental illness, and is aware that the person has a mental illness, that person becomes less likely to stigmatize them. Corrigan said in many ways the challenge faced by people with mental illness is similar to that faced by the LGBT community. And just like with campaigns for sexuality and gender equality, the people seeking acceptance had to be the ones doing the work of changing minds in their own families and friend groups. “The LGBT community is motivated to stop homophobia, and so it naturally falls to their hand,” he said. But Corrigan said “coming out” as a person with a psychiatric condition can be beneficial in more ways than one. “Being in the closet is horrible for your mental health and physical health and so the other benefit of coming out is for your own wellbeing,” Corrigan said. The same holds true when it comes to mental health. As program director for a project called “Honest, Open, Proud,” Corrigan aides patients in walking through the process of considering disclosure, as well as methods and strategies to disclose that they have a mental health challenge. Corrigan said it’s essential that people with mental health issues tell their own stories—it’s not something someone else can do for them. Not everyone will feel comfortable being open, and each person needs to carefully consider whether and who they will tell. Only about one-quarter of patients with a mental illness will disclose, Corrigan said, but it can have positive implications for the self-esteem of those who do, and it can also indirectly help others struggling with mental illness. “We all need to be understood,” he said.